The eyeball has a limited number of ways to react to insult, the most common is redness. There is a thin mucus membrane (parts of the eye) that lines the inside of the eyelid and folds over to cover the outside of the eyeball. Inflammation or irritation of this tissue can lead to red eyes. 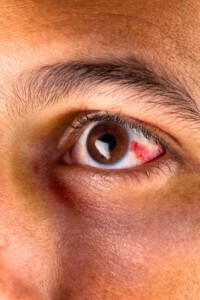 Bloodshot Eyes: The eye can become very dry due to systemic problems (see dry eye) or in reaction to transient environment conditions, medications, drug or alcohol use. In response to dry eyes the blood vessels just beneath the sclera (parts of the eye) fill with blood and become closer to the surface and cause red eye. Generally, drops designed to get rid of the this form of red eye, treat the symptoms by constricting those blood vessels, as these drops wear off the blood rushes back, enlarging the vessels further, requiring continuous use. Rewetting drops and whole body hydration treat the cause and resolve the red eye. Conjunctivitis: An inflammation of the conjunctiva can lead to red eyes and has several causes. Bacterial Conjunctivitis: A bacterial foreign to the eye can cause considerable swelling of the conjunctiva and redness on the front of the eye and excess thick, green-colored mucus production. Often the patient awakens with their eye, literally glued shut by this discharge. Starting in one eye the infection will usually spread to the other eye. Left untreated this infection can spread from hand contact or towel sharing to other members of the family. Antibiotics will often resolve the red eye in five to seven days. Viral Conjunctivitis: A virus can lead to the same symptoms as a bacterial conjunctivitis. The major difference in that the discharge is usually white in color. 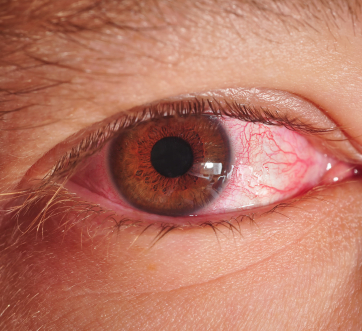 While antibiotics will not resolve this form of red eye, some patients experience relief from the symptoms of dryness and itching caused by the virus and a doctor may prescribe them. Allergic Conjunctivitis: Airborne pollens or other particulates can trigger an inflammation of the conjunctiva and lead to a mild red eye reaction. Again, the symptoms are very similar to the other forms of conjunctivitis except the discharge experienced is usually clear. Special over-the-counter drops can be recommended, or more potent prescription medication can be prescribed by the Eye Doctors associated with Parrelli Optical®.